Dr. Ron Lemckert specializes in Otolaryngology and provides patients with expertise and profound experience in facial cosmetic surgery, laser and injectable artistry. As an Assistant Professor of Surgery for McMaster University Medical Centre he has had many academic appointments including previous Chief of Otolaryngology at McMaster University Medical Centre. Dr. Lemckert is regarded as a true specialist of aesthetic medicine. Dr. Lemckert received his BSc in Biology at Dalhousie University, Nova Scotia before completing his MD at Memorial University, Newfoundland. Following, he returned to Dalhousie University to pursue his residency in Otolaryngology. Today, Dr. Lemckert remains a surgical educator for medical students and residents. He is committed to the advancement and innovation of his field. 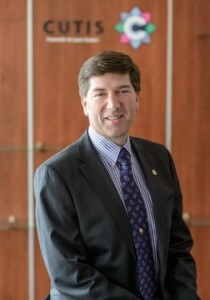 Dr. Lemckert is an active member of numerous community and medical associations including the Dundas Rotary Club, the Hamilton Academy of Medicine, the Canadian Medical Association, the Canadian Society of Otolaryngology – Head and Neck Surgery, the Canadian Laser Aesthetic Surgery Society and the Ontario Medical Association. Dr. Lemckert holds the position of vice president of the Canadian Laser Aesthetic Surgery Society. He is globally recognized as a luminary aesthetic provider and physician educator of advanced injection techniques of BOTOX COSMETIC® and JUVÉDERM® facial filler. As a Medical Director of Cutis Cosmetic & Laser Centre, Dr. Lemckert maintains an active role in surgical consultations, treatment planning and follow-up. Patients in his aesthetic and surgical care benefit from his unique facial specialty in both surgical and non-surgical platforms. Dr. Lemckert is also a repeat winner of the Hamilton Spectator’s Readers’ Choice Award for Facial Cosmetic Surgery. Dr. Lemckert is pleased to provide professional consultations by appointment. For further information or to schedule an appointment, contact our coordinators today.